(PantherMedia / Dmitriy Shironosov) Head lice are tiny parasites that live in our hair and feed on blood from our scalp. Their bites can itch and many people find them quite repulsive. Aside from that, they are fairly harmless and don’t carry any diseases. Head lice mostly lay their eggs near the roots of the hair, close to the scalp. The next generation usually hatches within one week. The eggs laid by head lice are called nits. Head lice multiply and spread quickly. They are often unwelcome visitors at day care centers, kindergartens and schools. Once lice have settled on your scalp, they don’t go away on their own again. But there are a number of different treatments that get rid of these bloodthirsty little creatures. Head lice are most common in children. They nearly always spread through direct body contact, for instance when children play close together. Although some people think head lice are a sign of uncleanliness, the lice don't care whether your hair is clean or dirty. They feed on blood. So anyone can get head lice. Girls are somewhat more likely to be affected than boys. It is thought that girls do more activities with their heads close together than boys do. Hair length doesn't have any effect on your risk of getting head lice – but it's more difficult to find the parasites in long, thick and curly hair. Head lice are quite common, especially among children between the ages of 3 and 12 years. Although no exact figures are available, it is estimated that about 1 to 3% of all children in Germany have head lice, but there are no exact figures. It's also quite common for there to be outbreaks at kindergartens, day care centers and schools. The lice typically appear in the first few months following the summer break – that is, late summer and early fall. When there's a head lice outbreak at a day care center or school, parents are often asked to carefully check their child's hair for lice. This can be done using special lice combs that are available at pharmacies, drugstores or medical supply stores. It's best to first wet the hair and then carefully comb it strand by strand from the roots to the tips of the hair, at least twice. It's easier to find the lice if you wipe the comb on a sheet of paper towel or a cloth after each strand of hair. Full-grown head lice are 2 to 3 mm long. Their bodies are flat, wingless and grayish-brown. Unlike fleas, lice are not able to jump. But their six legs give them the ability to hold on tight to human hair and crawl along it. Because head lice are so small, it’s difficult to see them in thicker areas of hair. A magnifying glass can help you find smaller lice. Head lice usually lay their eggs (nits) on the nape of the neck or behind the ears. They stick firmly to your hair, usually at a distance of less than one centimeter from the scalp. Other small objects found in hair, like dandruff or scabs, can be mistaken for lice. But dandruff and other small, loose objects don’t stick to the hair and will fall out when shaken. There is no surefire way to prevent head lice. But there are some things you can do to stop head lice from spreading if a child has them. The lice are almost always passed on to other children through direct head-to-head contact. put clothing and objects like stuffed animals that can't be washed at over 60 degrees Celsius in a sealed plastic bag for three days. Pets don't need to be treated: Head lice only live on humans, not on animals. It's also not necessary to disinfect your home or to use any insecticides. Plant-based treatments (for example coconut oil) are also available. There’s a lack of good research on the effectiveness of these kinds of treatments, and on that of home remedies such as olive oil or mayonnaise. Head lice have now built up a resistance to some insecticides, so these products are less effective than they used to be. Treatments with silicone are becoming more popular. They don't contain insecticides, so there are no problems related to resistance. 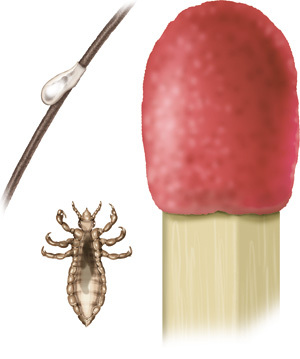 Silicone-based treatments cover the lice with a layer of oil, causing them to suffocate. Most of them need to be re-applied after about 7 to 10 days. You can read the package insert to find out about exactly how to use the product you have. In Germany, most head lice treatments are covered by health insurers if they are prescribed for children under the age of 12 years. They can be picked up from pharmacies. Combing out the hair with a lice comb is not enough when used as the only treatment. But it's important to use the comb in order to check whether the treatment has been successful. Experts recommend re-combing the hair every three days for at least two weeks after applying a head lice treatment. If your child still has a few nits after being treated for head lice, but you have not found any lice for a while, the parasites are probably gone. Nits or parts of nits may stick to hair for weeks after having head lice. You can tell roughly how old the nits are based on their distance from the scalp. Hair grows at a rate of about one centimeter per month. So any nits that are more than one centimeter away from the scalp are probably older eggs that won’t live. How can head lice be treated? A lot of people still think that lice prefer dirty hair – so it can be uncomfortable or embarrassing for parents and children. But in fact there is no link between personal hygiene and head lice. Because head lice can spread so quickly, the parents or guardians of a child with head lice are required by law to notify public institutions like the kindergarten or school. You may feel a bit awkward about calling, but there's no reason to be embarrassed. Head lice are a frequent problem at most day care centers and schools. It’s also important to tell family members and friends who recently had contact with the child. According to German law, children who have head lice must stay away from kindergarten or school until they are free of lice. A child who has been given a treatment proven to be effective may return to kindergarten or school the next day. You can ask a pediatrician or pharmacist about which products qualify and which are paid for by statutory health insurers. Many institutions only require a statement from the parents confirming that the child has been treated. Others ask to see a note from the doctor. When people are ill or need medical advice, they usually go to see their family doctor or pediatrician first. Read about how to find the right doctor, how to prepare for the appointment and what to remember. Bauer E, Jahnke C, Feldmeier H. Seasonal fluctuations of head lice infestation in Germany. Parasitol Res 2009; 104(3): 677-681. Bundesministerium der Justiz und für Verbraucherschutz, Juris. Gesetz zur Verhütung und Bekämpfung von Infektionskrankheiten beim Menschen (Infektionsschutzgesetz - IfSG). Burgess IF, Silverston P. Head lice. BMJ Clin Evid 2015: pii: 1703. Deutsche Gesellschaft für Kinder- und Jugendmedizin (DGKJ). Kopflausbefall (Pediculosis capitis): ein Ratgeber für Kinderärzte. 2018. Devore CD, Schutze GE. Head lice (American Academy of Pediatrics Clinical Report). Pediatrics 2015; 135(5): e1355-1365. Eppinger M, Müller M. Pädiatrie. Für Studium und Praxis. Breisach: Medizinische Verlags- und Informationsdienste; 2017/18. Koch E, Clark JM, Cohen B, Meinking TL, Ryan WG, Stevenson A et al. Management of Head Louse Infestations in the United States - A Literature Review. Pediatr Dermatol 2016; 33(5): 466-472. Robert Koch-Institut (RKI). Kopflausbefall. RKI-Ratgeber. November 17, 2008. Speare R, Cahill C, Thomas G. Head lice on pillows, and strategies to make a small risk even less. Int J Dermatol 2003; 42(8): 626-629.